Someone's "0" will have to go when undefeated prize fighters Floyd Mayweather Jr. and Saul "Canelo" Alvarez collide in a championship showdown that goes down this Saturday night (Sept. 14, 2013) on Showtime in "Sin City." Who's it going to be? The biggest boxing event of 2013 -- and perhaps the biggest of the present millennium -- is going down this Saturday night (Sept. 14, 2013) from MGM Grand Garden Arena in Las Vegas, Nevada. The sport's No. 1-ranked pound-for-pound fighter and bonafide megastar Floyd Mayweather Jr. will look to shut down Mexican wunderkind Saul "Canelo" Alvarez in a Showtime pay-per-view (PPV) of unprecedented proportions. And if that weren't enough, the fight everyone who enjoys people punching each other has been begging for for months will co-headline the blockbuster PPV. Danny "Swift" Garcia, whose stunning upset of Amir Khan in 2012 sent him rocketing to the top of the Junior Welterweight division, will finally take on possibly the most feared puncher in boxing today, Argentina's murderous "Machine," Lucas Matthysse. If everything goes according to plan, this will be one boxing event for the ages. Therefor, it's only fitting, then, that rather than just look at the main event, we break down both of the highly-anticipated showdowns carrying this card into history. To be perfectly honest, if I had to choose between seeing this or watching the main event, I'd be perfectly content turning the set off after this one. Unless one or both of these guys hit their heads on the ring steps and immediately take up pacifism, I simply can't imagine this being anything other than spectacular. I also find it exceedingly difficult to imagine this being anything other than another scalping by Matthysse. Garcia is a strange fighter -- he's not that fast and his punches are kind of wide. You'd be hard-pressed to dissect it and find the root of his elite status. The thing is, it works. Those wide punches land and they land hard. His left hook, which at times features full extension of his arm, hits with thunder rarely seen at his weight. Despite a visually unremarkable style, he is also lethal on the counter. I just do not believe he can overcome two glaring issues. The first: Countering Matthysse is not a bad gameplan; however, the problem is that Garcia is the wrong kind of counter fighter to survive Lucas' power. Garcia counters from inside the pocket in the midst of or just after heavy exchanges -- he plants his feet in range and fires back. Against someone with the bone-crushing power of Matthysse, this leaves him incredibly vulnerable. Even a glancing blow from "La Maquina" is enough to put 90 percent of the division on their rears. No matter how well his jaw has held up against the rest of his competition in the past and no matter how devastating his left hook, Garcia absolutely cannot take one to give one against Matthysse. The second: Matthysse, by all accounts, cannot be backed up. His punches are tighter than they are given credit for, but he can get uncomfortably wild, particularly when he smells blood. Other fighters have exploited this, but Matthysse has never been fazed by return fire. Zab Judah hit him with his best shot -- a picture-perfect counter left uppercut -- and got only a nod of acknowledgment for his trouble. Garcia, on the other hand, can be hurt. And that's the key difference in this fight. By all accounts, both men are likely to take a considerable number of shots from their opponent. In such a battle, durability is king. I am not convinced that anything but Garcia's absolute best shot can hurt Matthysse. Meanwhile, everything Matthyssethrows hurts. As someone mentioned in regard to Jhonny Gonzalez's knockout of Abner Mares, there are some fighters against whom there is no such thing as a good chin. There is nobody below 147 pounds who can survive a flush barrage from Matthysse. It will be entertaining while it lasts, which I don't believe will be very long. They will trade heavy leather, because that's the only way they know how to fight, and in the midst of a thunderous mutual fusillade, Argentina's indefatigable battleship will find his target. For all the hype surrounding the youth, size and power of Mexico's rising son, I see only two avenues of victory for "Canelo" against "Money." The first is the standard method of victory: Bomb Mayweather in the first round. "Money" is never "vulnerable," but the puncher's chance is at its most significant when he has yet to sufficiently analyze his opponent. Alvarez, despite what has been suggested, is not in the same tier of power as Matthysse and Gennady Golovkin. He has, however, demonstrated the ability to hurt Junior Middleweight competition on a regular basis. In all likelihood, he has the most raw punching power of anyone Mayweather has faced. The second, and the one he will almost certainly need to employ, is to consistently force Mayweather into the ropes or corners and punish him to the body. There are, one could say, two Canelos. One emerges when his opponent is consistently mobile. This Canelo is a solid boxer, but certainly not the caliber of Juan Manuel Marquez or even Miguel Cotto, both of whom succumbed to Mayweather. The Canelo that emerges when he can plant his feet, however, is a terrifying sight to behold. His combination punching is devastating and beautiful to watch, particularly his murderous left hook to the body. Mayweather has, in the past, been content to seat himself in the corner and rely on his impeccable head movement (and seemingly omnipresent shoulder) to avoid damage. This is an opportunity Alvarez must exploit with absolute fury. It doesn't matter whether he hits shoulder, elbow or torso ... he has to damage Mayweather. 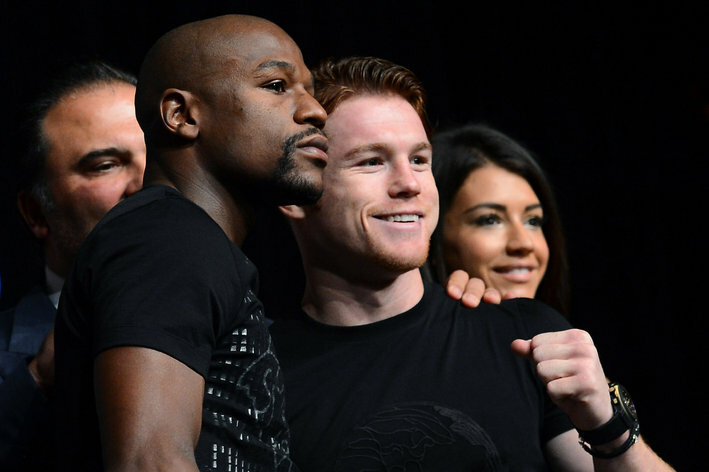 And with the kind of firepower "Canelo" brings to the table, this is not inconceivable. It does, however, require a level of cardio and adaptability that the young superstar has yet to demonstrate. Alvarez has been criticized in the past for fighting in spurts -- he can give one or two good minutes out of a three-minute round and may take a round or two off to recuperate at times. In an ideal case, the extra two pounds he will be forced to shed will compel him to do unprecedented amount of cardio work, but the more likely outcome is that he is forced once again to fight in spurts, which will do him no good. I have said before that, aside from just blasting him with bombs until he goes down, there is no "Plan A" good enough to beat Mayweather. One needs not only "Plans B and C" and beyond, but the ability to switch between them as soon as Mayweather begins to figure out the current one. Simply put, Alvarez is not capable of that feat at this time; in fact, there may not be a fighter out there who is. Mayweather may be a knucklehead outside the ring, but his fight IQ is peerless. He is, unquestionably, a genius of the Sweet Science. Meanwhile, Canelo is big and strong; however, he is not the man to succeed where more than a decade of the elite have failed. MMAmania.com will deliver LIVE fight coverage and results of "Mayweather vs. Canelo" from the opening bell to the last interview this weekend.